IBM and Yahoo have come together to launch an entry-level enterprise search product. The IBM OmniFind Yahoo Edition can index up to 500,000 documents, more than 200 file types and documents in more than 30 languages. The enterprise search is a three-click install and comes with the open source Lucene library for cross-platform, full-text indexing. BEA Weblogic Portal Team has published a capacity planning document that compiles and brings together some of the best practices around the portal performance tuning. India central government has enlisted IBM to help it build a Web portal that citizens can use to access thousands of services, ranging from business permits to housing subsidies and tax advice. Check out the details here. Sun has released Java SE 6. Check out the details here. Literally, Metadata is data about data or more precisely it is information about the data that is not, business data. The classic example would be a database schema, which uses a precise language to describe the data held in the database. In the software development world, the Metadata is used to customize or control the behavior of software systems. Software Products provide a varied levels of configurability into their systems to accommodate a broad range of needs. Application Developer proffessionals can leverage the same approach to make applications more adaptable to changing business conditions. They incorporate metadata into their design thinking to create more agile business systems, whose behavior can be changed outside the software development cycle. Check out more details on Metadata here. Pranshu have mentioned about the skills required for an architect here. I want to add some more implicit factors that I have encountered while architecting solutions that can make difference between success and failure of a project. Identify the stakeholders – It is very important to identify the stakeholders in the project. Business Folks - The business folks will provide the requirements, timelines, and scope and budget availability. IT Folks - The IT folks will provide the details on the existing architecture, business applications, architecture vision and roadmap, maintenance schedule for the existing applications, environment guidelines, and standards around development, tools to be used and so on. 3rd Party Vendors - In these days of multi vendor strategies, you may have to work and co-ordinate with the multiple vendors at the client organizations. If the other vendor is strongly entrenched, he/she can make your life miserable. The success of the project will depend on the co-operation. There have been cases where delay by the 3rd party vendors might disrupt your schedules and quite possibly even the blame might come on you for not managing the project properly. SME – Next important group are the SME’s. It is very important to identify and blocking their time from the requisite SME’s on the project. You might want to book their calendar in advance. Lot of times, key people who understand the system might have left the organization (that’s why client gave you this project), so you may have to look at alternate avenues. End User - This group might be internal. So make you meet the key people and understand their expectations from the project. They will form the key factor in the User Acceptance Testing phase of the project. It is very important to carry both the parties along if we want to make a successful delivery. Further, identify the person who will be signing off on the artifacts that get produced. It is very important to identify the priority of each of these for the identified stakeholder. It will help you in identifying which is critical factor when architecting the solution. E.g. If time or go-to-market is critical factor, you might want to look at creating a simple solution. If scope is huge or not defines properly, going for an iterative approach will be preferred choice. Identify the standards – Understand your client organization standards for everything – documentation, quality, software, hardware etc. The sign off on a deliverable can get struck because it does not satisfy the requisite standards of the client organization. Most of the Fortune 500 organizations have Software Review Boards – that take a call which software (including open source libraries) can be used for projects within the organization. Anything new, means more paper work and time to get the requisite approvals. Again here, the key IT folks can help you in getting the approvals on a fast lane. Besides this, you still need to go through the rigors of approaching the project as defined. But the factors mentioned above are not really part of the regular project architecture and management process. I had talked about the Portlet Container in WAS V6.0 here. Now, this article examines the JSR 168 portlet container available in IBM® WebSphere® Application Server V6.1 and differentiates its use from IBM WebSphere Portal. Lucene is a full-text information retrieval (IR) library written in the Java™ programming language. Now it's an open source project in the popular Apache Jakarta Project family. Discover how to implement advanced searching capabilities, and learn how to create a robust Web search application using Lucene. In this article, you learn to implement advanced searches with Lucene, as well as how to build a sample Web search application that integrates with Lucene. The end result will be that you create your own Web search application with this open source work horse. Forrester evaluated 13 leading open source software projects across approximately 40 criteria and found that six of the projects stand out as examples of excellence. The strongest Leaders are MySQL, Eclipse IDE, Apache HTTP Server, Apache Tomcat, JBoss Application Server, and PHP — thanks to their strong governance, well-defined road maps and release plans, and large and active communities. These six projects are followed closely in the Leaders category by Hibernate and Apache Velocity, the former because of its wide usage and strong support, and the latter because of its maturity and stability. Strong Performers are PostgreSQL and Spring Framework, both of which have capable leadership, active communities, and good presence in the market but don't have some of the benefits that a strong commercial supporter can provide. IBM® WebSphere® Application Server includes simple and straightforward tools that remove the complexity of migrating from a previous release to Version 6.1. This overview of the migration process will prepare you for what you need to do and what you can expect so that your migration can be as quick and easy as possible. 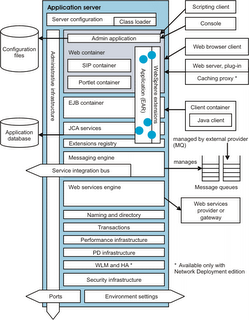 This article provides an overview of new Web services features and enhancements in IBM® WebSphere® Application Server V6.1, including support for WS-Business Activity, WS-Notification, WS-I Basic Security Profile, and WS-Resource Framework specifications. IBM has announced the release of the WebSphere Portal V6. I had put in a sneak preview of the IBM WP V6 features here. There is a new article on the developerWorks detailing the technical enhancements and the improvements to the WebSphere Portal V6. Check out the article here. Today, IBM has announced the acquisition of FileNet.The acquisition will allow IBM to further consolidate its offering in the ECM space, specially the high-volume transactional documents management systems. With this, IBM moves ahead of ECM and will have close to 18% share of the Document Management Market (as per IDC Research). The acquisition leaves only Vignette, Broadvision, Stellent and Interwoven as pure play players in the market. Keeping my fingers crossed and waiting for the next company to get gobbled up.